Over the course of 22 years, six Mission: Impossible movies, and incalculable hours of cardio, Tom Cruise has continued to prove that he is no mere mortal. Throughout the action franchise, the now-56-year-old actor has continued to defy death, gravity, and aging in any and every way, upping the stakes with each installment. Obsessively dedicated to doing his own stunts as realistically as possible, he’s jumped off cliffs, scaled the tallest building in the world, held onto the side of flying planes, and so much more. 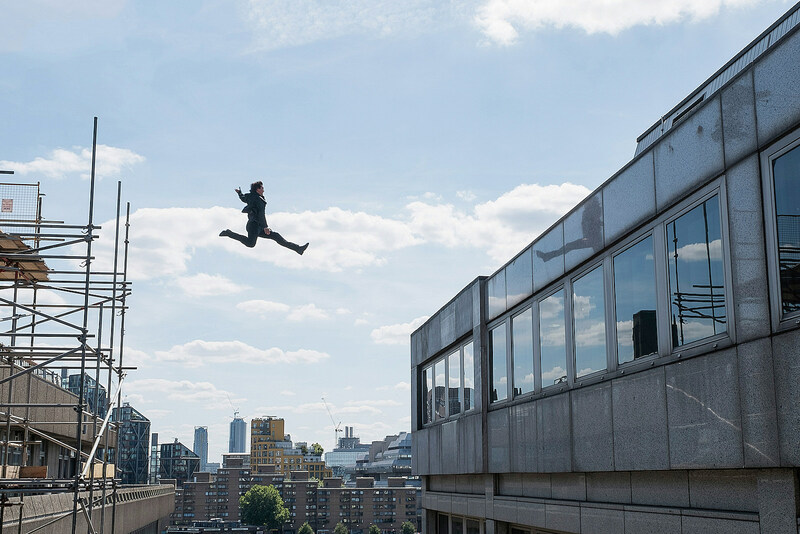 In Christopher McQuarrie‘s Mission: Impossible – Fallout, Cruise, as secret agent Ethan Hunt, goes on his craziest mission yet to stop an organization of evil spies and prevent a nuclear catastrophe. He dangles from a helicopter, skydives, and races across the rooftops of Paris at an equally inspiring and exhausting speed. With the latest film opening this weekend, I’ve ranked not just the best stunts and action sequences of the franchise, but all of them. The thing about the Mission: Impossible movies is that even at their weakest points, they’re exceptionally thrilling spectacles. So without further ado, here’s all 40 action scenes from the six M:I movies ranked from best to worst (but still pretty good). And don’t worry, there’s no Fallout spoilers. There’s a lot about John Woo’s much-derided Mission: Impossible sequel that I’ll stan for, as you’ll see on this list (and hey, I’m not the only one!). But the laboratory shootout is the corny apex of the movie, and a lot of Woo’s slow-mo photography hasn’t aged well. Ethan Hunt is at his least interesting when he’s got nothing but a gun in hand, and this sequence reduces him to any other action hero out to save the girl. That said, even the most disappointing M:I set pieces have something worthwhile, and here we get to see Ethan escape with an epic leap out of a building. This scene isn’t a bad way to suspensefully kick the plot into motion, but it loses major points for killing off/wasting Emilio Estevez and Kristin Scott Thomas so soon. Hasta lasagna, I guess. Wait, is that Swayer from LOST? Where the heck is Ethan? Before you can figure out who is who and what is going on Josh Holloway’s agent Hanaway is already falling backwards off a building onto an inflatable landing pad. Tom Cruise running from an exploding fish tank is the Aquaman movie we deserve. After somehow surviving a bomb attack at the Kremlin, Ethan walks along the edge of a four-story hospital to make an escape. The best part is watching him realize his plan was flawed, then miraculously coming up with a new one on the spot: Improvisation as survival, the signature Ethan Hunt tactic. Rogue Nation‘s motorcycle chase is by no means bad, it’s just not nearly as exciting as what McQuarrie pulls off in Fallout or John Woo’s nutty motorcycle finale in the second film. I love me a good chase sequence, but this one goes on a bit too long and feels superfluous as it leads into Solomon Lane’s capture. Ilsa is the highlight as the film gives Ferguson a chance to take out the Bone Doctor with her signature over-the-shoulder leap. It may be the coolest-looking move in this whole franchise, or any action franchise. Jeremy Renner’s Brandt is all of us if we were put on Ethan Hunt’s IMF team – he’s the skittish and skeptical counterpart to Cruise’s fearless, daredevil agent. He’d rather do things the cautious way than, you know, dive straight into a spiked propeller fan. He’s a nice contrast to Cruise, but I’m oh so glad Renner never took over the franchise. This sequence is light on the action – the only violent element is the IMF’s truth serum darts – but it’s another clever mask switcheroo when Ethan impersonates MI6 chief Atley. In Vanessa Kirby’s first scene as Fallout’s White Widow – who has a fun hidden connection to the first movie – she proves she’s no damsel, but a woman who can whip a switchblade out of her garter belt and use it frighteningly well. The women of the M:I franchise get forgotten as quickly as Ethan’s missions self-destruct. (Miss you Thandie Newton, Maggie Q, and Keri Russell!) But Ghost Protocol finally gives its female agent something notable to do, with Paul Patton’s Jane throwing Lea Seydoux’s Sabine across a hotel room before effortlessly kicking her out the window of the world’s tallest building. Whoops. The scene sounds like it sound be in the top 10: Ethan Hunt wrestling a sniper on top of stage lights mid-opera. But the sequence doesn’t quite sustain the tension, and could benefit from tighter pacing. That said, Ethan and Ilsa’s rooftop escape – “Shoes please!” – is as effortlessly smooth as ever. I won’t spoil this one too much before the movie comes out, but it’s a surprising sequence that involves Ethan rejecting an established plan to do things his own way. Diving through rotating rooftop panels undetected and quickly enough to send your harness rope back up before it closes? No sweat. No, literally, there’s no sweat in this fun callback to Ethan’s Langley dive. One of my favorite things about Ethan Hunt is that even when he’s out of his mind racing a car backwards in the middle of a street chase, he pauses to make sure Benji has his seatbelt on. This is another one I can’t quite spoil and there’s no clip for it yet, but it’s a tense shootout with the IMF team that has one heck of a twist, and then some. There’s Ethan Hunt riding on a speeding train. There’s Jean Reno flying a helicopter inside a train tunnel. There’s Ethan riding on the helicopter inside the train tunnel. The visual effects certainly don’t hold up 22 years later, but it’s still blissfully nuts in every way. The only thing that can distract Ethan from a the job is his wife Julia (Michelle Monaghan) or Thandie Newton. The over-the-top action and the schlocky romance plot (quickly forgotten after this installment) collide in one perfectly ridiculous sequence that finds Ethan and Nyah locking eyes as their cars spin out of control on a mountain-side highway. Of course she nearly falls off the cliff, of course he saves her, and of course they nearly get it on right there in the front seat. Ethan’s rescue mission to save Keri Russell’s agent isn’t too spectacular in itself, but the helicopter escape after? Hoo boy, it’s wild. Not only does Ethan try to neutralize the mini bomb about to implode inside her head, but Jonathan Rhys Meyers dodges missiles while flying through a wind farm and Maggie Q’s Zhen nearly gets knocked out of the copter. Cruise catapults his entire body up a steel pipe with his bare hands ... which are handcuffed. Don’t try this at home. I can’t tell you why this belongs in the top 20 without spoiling things, but trust me, this is the best and most clever Mission: Impossible opening sequence yet. Here’s an impossible mission if there ever was one: Sneaking into the Vatican. From the “Humpty Dumpty” wall crawl to the face-swap kidnapping to the hilarious “What’s up?” sewer escape, this is a Mission: Impossible gem. The insane skydiving stunt, which is three shots stitched together to look like one, required the Fallout crew to build custom equipment for Cruise so he could pull off the sequence himself. He also did the jump with a broken ankle, just to make things more complicated. But even without knowing all that context, it’s a heart-racing thrill to watch him and Henry Cavill’s August Walker dive out of a plane in the middle of a lightning storm. I love any sequence where Cruise makes the outrageous look easy, maybe even too easy. Here he makes escaping from a Russian prison and going against the IMF’s plan look like a breeze. Besides acrobatically hopping between floors and dodging bigger dudes’ fists, it’s Ethan’s deadpan shrug to the guards that makes this a quintessential M:I moment. Oh, to have the cocky confidence of Tom Cruise. Ethan has a bomb inside of his brain and still manages to fight off Philip Seymour Hoffman’s menacing bad guy and rescue Julia. Did I mention Ethan dies and comes back to life? Just another day at the office. Ethan dives 120 feet into a hyper-secure water tunnel where he has three minutes to plug in a security card (under water), dodge a rotating contraption, and open a locked hatch to escape (again, all under water). Most insane though? Cruise held his breath for over six minutes to shoot the sequence. No big deal! I mean, do I even need to explain this one? In the M:I movies, Ethan is either running after someone or from something. In Ghost Protocol he does both: Funning to catch Michael Nyqvist’s Hendricks with the nuclear launch codes while attempting outrun Mother Nature. The sandstorm foot chase turns into a car chase with one heck of a suspenseful ending that finds our favorite super-agent nearly getting crushed by an SUV. McQuarrie’s chases in Rogue Nation were fine, but didn’t bring anything special to the table. Fallout has one of the best chases in the franchise, with Cruise racing against traffic around the Arc de Triomphe in Paris, getting hit by a car, and still somehow escaping. It all ends with a hilarious nod to another favorite sequence from an earlier film. There’s so much to love about this sequence: Simon Pegg’s Benji is now in the field, the ingenious screen projection trick, and the fact that Hunt somehow outruns and survives the bombing inside the dang Kremlin. But my favorite bit? How seamlessly Ethan swaps disguises from Russian official to nobody tourist. Where can I get that jacket? Haters are gonna hate Woo’s Mission: Impossible sequel, and sure, it’s not all good. But how can you deny the simple pleasure of watching Cruise fire a gun mid-cartwheel and race a motorcycle while clad in a leather jacket and shades? And that hair! He just looks too damn cool. Then it all ends in a beach brawl where Cruise and Dougray Scott’s Ambrose catapult into each other as their bikes explode in the background. This is cinema. This J.J. Abrams-directed sequence has a bit of everything: Cruise running from explosions, dodging bullets, dodging missiles, emerging from a car crash unfazed, oh and leaping over a massive hole in a destroyed bridge and nearly falling to his death. Tom Cruise runs a lot, we know this. But in Fallout‘s Paris rooftop sequence, he runs harder than you’ve ever seen him run before, so much that you’re a little worried he’s about to collapse and die on camera. He almost does in one literal bone-crunching shot where the 56-year-old broke his ankle leaping from one roof to the next, causing a production hiatus. Watching Cruise drag himself off camera after the injury, then return months later to film the rest of the chase (and the rest of the film’s big set pieces) on a broken ankle only make this sequence more jaw-droppingly astonishing. Try fighting a villain inside an automated moving parking garage as the ticking clock on a nuclear missile gets closer to zero. Now try doing that with a busted kneecap and twisted ankle. Then to top off the film’s finale with a typically bananas final stunt, Ethan straps in and nosedives a car straight into the ground. The most insane car commercial ever, or a day in the life of Tom Cruise? Maybe both. Ethan Hunt is so out of his mind, even his vacations are as dangerous as his day job. Who needs a terrorist to pursue or a mission to complete for a nerve-jangling set piece when you’ve got a guy willing to solo rock climb 2,000 feet above ground, all with the casual ease of a Sunday stroll? This was the stunt that set the bar for the rest of the series, informing us that Mission: Impossible was no mere action franchise, but one where Cruise would entertain us by proving his and Hunt’s immortality. If Superman and Ethan Hunt can’t take down a bad guy in a two-on-one fight, that bad dude must be pretty skilled. The bathroom brawl in a Paris nightclub is easily the best fist fight of the series, one that finds Henry Cavill reloading his biceps, Cruise on the verge of collapse, and more than one person launched through a wall. Plug this into my brain and play it on loop forever please. The most iconic set piece from the first movie may not have the daredevil stunts of the rest of the series – the biggest risk here is just getting caught – but it remains a master class in breathtaking suspense. Watching Cruise suspend his entire body inches from the floor and, somehow, miraculously catch the sweat dripping from his face still holds up as one of the franchise’s most clever sequences. And we mustn’t forget Jean Reno. He crushes a rat with one hand. This was the pre-game for Ghost Protocol‘s Burj Khalifa climb. In this case, Ethan Hunt’s on a wire as he leaps off a Shanghai skyscraper, but it all becomes outrageously nutty after he jumps out of a window, gets whiplashed across the city, smashes into another building, then gets sucked out by his parachute, landing in the middle of traffic. But we’re not done yet! There’s still a car chase and shootout to be had where Cruise leans sideways out of a speeding jeep. With every new M:I movie, Cruise has to find a new way to defy gravity. In Fallout, he does that about 50 times, and then some. The helicopter finale sees him dangling from a rope tied to a copter, flying a copter (yes, it’s Cruise piloting it himself) and topping it all off with a bonkers fist fight finale atop a cliff. The fact that everything you’re watching is Cruise and not a stuntman only adds to the nerve-rattling suspense. It’s so nuts you find yourself laughing at the insanity of it all. After two viewings of Fallout, I’m pretty convinced it’s the best of the franchise, but still only better than Ghost Protocol by a hair. As excellent as the Kashmir climax is, it still doesn’t quite top the famous Burj Khalifia climb. Impeccably directed by Brad Bird, the standout Ghost Protocol set-piece finds Ethan climbing up, running down, and swinging around the tallest building in the world. It’s the ultimate Mission: Impossible moment.